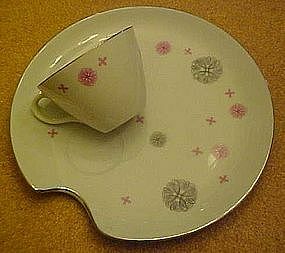 Nice snack set with a artist's palate shape and decorated with pink and grey spirograph type designs and gold trim. Made of nice white china. Plates measure about 8" x 8 1/2". No makers mark or stickers. There are 4 cups with the 4 matching plates. Indentation in each plate for the cup to rest in. No chips or cracks on any of the pieces. All excellent, and sold as a service for 4.